Home » Personal Finance » Dissecting "Gift Guilt" - When Does Receiving a Gift Make You Feel Bad? Ever since I was a child, I have been taught that when you receive a gift you should be happy about it and then give something back in return. To this day I still believe that is good manners, but sometimes receiving gifts is stressful for me because of what I call "gift guilt". Read on to see what I mean. The most common kind of gift guilt occurs when someone gives me something but I do not have something to give back or I did not intend to buy a gift for that person. This has happened a few times at work, and most of the times I just said thank you and carried on. I think this is the easiest type of gift guilt to deal with because I can just give something in return. Another type of gift guilt is when I sincerely do not want or cannot use the gift. For example, I have received clothes from relatives in China that I cannot wear. I could not send the clothes back or return them to a store so they were given away to random people. It is sad that I cannot appreciate the gift, but sometimes that is how thing are, and I feel guilty for not liking or using a gift. Then there is the unsettling guilty feeling brought on by an extremely large gift. I feel indebted to people when they give me gifts with a large monetary value, and if the gift came from someone I barely know I would probably return it just to feel at ease. Maybe I am just paranoid, but I suspect that accepting a ginormous gift from an acquaintance could come back and bite me. The worst kind of gift guilt I get is when friends in debt give something to me. I do appreciate the gesture, but I feel bad about it because I feel that their need for the money is more than my need for a gift. At the same time it is also hard to say "I cannot accept this gift because I know you need the money to pay off your debts." That just sounds really condescending, but sometimes I really do feel like screaming, "pay off your credit card bills first before you give me something!" I think this way because I do care about them, but it is hard for me to say it out loud. With that said, I do like giving gifts more than receiving them because there is less paranoia and guilt involved and I have never regretted giving out something. Perhaps I just think too much about this, and I should always just say thank you and move on, but sometimes I just cannot help feeling guilty about receiving something. Have you ever felt weird about receiving an undesired, unexpected, or unnecessarily generous gift? What did you do about it? I have this problem with several people. A relative who loves to shop and sends a big box of gifts every year. I don't know him well enough to know what to get him in return. From his gift choices he obviously doesn't know me very well either. A friend who suddenly decided that she needs to buy something for me at every possible holiday. This comes on the heels of more than 20 years of gifting only when we saw the perfect item for eachother. It worked so well before and now I just feel guilty if I can't find something perfect for each and every occasion. Another friend of the family who sends a generous check every Christmas. I never know how to reciprocate. It doesn't seem right to send a $10 calendar to somebody who sent me a $100 check. But it also seems pointless to turn around and spend that $100 on the person who sent it to me. I'm curious if people have good ideas to get people to stop the gifting cycle. I like to think that I'm a generous person, and I love giving gifts. But I'm burned out on trying to find gifts for people out of obligation. I was always taught to accept a gift graciously, but I wasn't ever taught that one had to be given in return. Giving something with the expectation of getting something back is extremely rude, in my book. How do you know the other person's situation? They might not like you, they might not have enough money, or it might not be convenient in other ways for them to return the gift. If you move in circles where you MUST get the gifter something, try not getting anything a few times. I bet people will soon stop buying you stuff, if they expect something back. As to what other suggestions might come up in this discussion. I have this problem with a few things. The ones you can't use are the worst because I sometimes feel like I have to keep them around and trip over them out of consideration to the person who just dropped it off for you. Even if you've clearly stated you are trying to downsize and streamline. And even if you've been clearly stating it for some time. Sometimes I ask myself is it really me that's not being thoughtful? Just my two cents. In the end I usually try to land on the side of "the gracious thing to do is the right thing to do". But it's hard when you've done all the work to organize your life and home the way you want and then have to do the work of fitting in stuff just to sit around and take up the space you carved out for the things you do want. This is a very long way of saying that I would LOVE some suggestions myself. Thanks, Xin, for the post. The problem (or maybe the benefit) of the big gift from relatives is that it's not expected to be reciprocated in kind. What that means in practice, though, is that it takes a lot of thought to give back something that doesn't seem inappropriate. If you have access to a family archive of photos (much easier in these days of scanners), you can have a nice picture of a common relative (grandmother, greatgrandmother, whatever) printed in 5x7 and put it in a pretty frame--if you're careful, you can get one for less than $10 that looks great. It's a thoughtful gift that acknowledges your closeness without trying to out-price anyone. More difficult with family friends, but if you have an older photo, particularly of your families together back in the day, this is a nice option. What I hate is the "let's not exchange gifts at Christmas this year" decision that nobody but me abides by!!! My MIL made the announcement year before last at Christmas. I was relieved because it can be pricey buying gifts for everyone. So, this past year, my DH and I arrived without gifts for the extended family and wouldn't you know it, they all gave us gifts, some rather extravegant by ones who normally give 'token' gifts. I was filled with guilt and couldn't enjoy the evening at all. Every year prior I had enjoyed giving everyone something even tho' it was tough on the budget. Never again; they'll all get something next time even if it is a simple homemade gift. Actually, I like them, kinda. I would much rather give than receive because receiving then becomes awkward, especially if I didn't have a gift for the gift giver (on days other than my birthday). I try to tell people not to buy me things but they don't listen! I also always try to communicate that I bought a gift because I wanted to or I thought it would be the absolute perfect thing for the recipient and they might not buy it - not because I want a gift in return - so no one feels guilty. But me, must be the lapsed Catholic, I become a mess. The stress of getting a gift from someone unexpected is way more than the joy of getting the gift - and that's for good gifts. It's worse when it's a token, 'I thought I should buy you something so here's a GPS that you don't need.' My parents just did that for my birthday on the advice of my husband, who I have since yelled at. Apparently my dad bought the device because he thought his was lost and then he found his and was going to return it and MY HUSBAND (idiot) said, give it to your daughter for her birthday. And my parents did. We have a GPS, it's my husband's, but I generally don't go anywhere unfamiliar without him and I definitely don't do it when he's also going somewhere unfamiliar, so we can share. And, I pretty much hate them, I like them when I'm lost but I hate them when they give me the wrong directions and because my husband is so dependent on it he can't get anywhere without it And there are things I need/want - like a rug for the kitchen or a freezer for the basement so I can make even more red beans and soups at a time and buy TONS of beef on sale or an area made in the backyard so I can grow cool purple tomatoes or NOTHING. But, instead, I have this GPS that I hate, that I don't think I can return or sell for fear of the guilt. I might as well have a $100 bill painted into the wall for all the good it's doing anyone. I do like well thought out gifts, my friend gave me a gift card to Trader Joe's so I can buy cheap wine and an Alton Brown cookbook and a toy for the dog - but I'm still eaten up with the guilt, because I didn't get her anything, although I did buy her a nice, yay, you have a baby gift, so maybe we're even. It's too much to keep track of. Anyway, enough from me. Great post!! And, please, spend your money on you and don't give me gifts!! There are certain relatives we give gifts to, never expecting a return, because they're always "broke". (Stuff like a double batch of homemade sugar free cookies for a diabetic.) They'd feel badly not getting anything for Christmas (our family members are all really little kids at heart) and we generally enjoy trying to figure stuff out for them. Another relative had the great good sense to say "let's just get things for the kids" and so we have with theirs. Our gifts can be homemade or purchased but "cool", hers are always purchased and "cool". One sister is an awesome shopper. There is no way to reciprocate in kind. It's not that she always spends a ton of money (we're both thrift store junkies) but she has an incredable eye and LOVES to shop. Then she wraps them in the most beautiful ways. I've framed some of her wrappings. We get her things she can't find easily in Florida. Vintage dishes from the 1930's in dandilion yellow. Another sister gives us lots of small things. Not our tastes, but reflective of what she likes and wants. We've found when we get her similar things the following year, she's delighted to receive them, "Socks!, just what I wanted, how did you know?" If we can be straight with each person that's best. If not, we try to enjoy the process, or at least not be so thrown by it. If we receive something horribly horrible, we bring it to the thrift store. Someone will be able to use it. Socio-culturally, I've grown up to believe that tasteful and appropriate gifts and its presentation etiquette are the mark of a well-bred and educated person. Well executed, and you are praised for your ingenuity and arbiter abilities. Poorly reciprocated, and you can eat a social suicide and snickered and paying with your "trashy" reputation. Be careful with this one, because in certain circles of popular society, this could be a land mine. 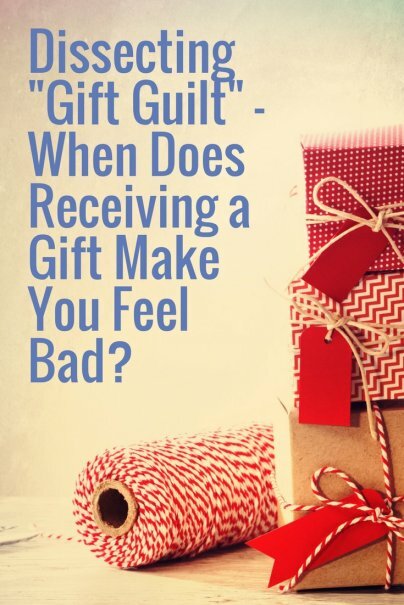 The nervous "guilt" associated with receiving gifts is rightly so because for some, it is a test to evaluate the premium of your social standing, your cultural depth, and who you are in relation to them. In my experience, I've used this strategic tactic to give gifts, and I myself have bombed miserably in gracious receiving. We do get better with practice. It's rarely just about money; it's really a complex and symbolic art about fitting in. Some of the best gifts are exactly what the other person wants, hard to procure, and sophisticated things that makes the other person look good. I need not explain how to prepare for or play this game adeptly, but essentially if you suffer from guilt and must respond to the gift, you should ask the CLASSIEST friend you know for advice. When I was young, I'd receive gifts from friends, parents' associates and relatives and my mother would go through lengths to teach me how to make the giver feel good, and tokens of reciprocation depending on our relationship, cleverness, and ensure that we were properly responsive. For a lot of people it was a crucial matter of classiness, wit, and smart reputation. As I got a bit older, I learned first hand that the penalties for not doing so could be: empty-handed embarrassment, appearing ingrateful or crude, vicious snickering about your character flaws or even alienating/insulting a potential ally. I also came to understand that grotesquely horrid gifts could an indicator of the other person's obtuse upbringing, a sign of a deteriorating relationship, or simply someone's financial strain. For instance, in reciprocation for a large sum of travel money, I got wealthy relatives was a set of hand-carve turtles from a remote village in Zambia, which they could never have gotten themselves and symbolized longevity in our culture, and an intriguing legend. After a trip to Idaho, I presented my good-humored neighbors each with a Russet potato. To the boss's birthday, I gave various bottles of Odwalla juice for his health. To some ill-conceived present, I promptly returned it to sender. And to some who re-gifted in absolutely poor taste, we just generously ignored, sent a thank you email, and donated it. If money is tight, it's best to conceal it with generous home-made cookies, symbolic things of appreciation, or a potted fern from the garden, an abundance of fragrant fruit, or dedicated artwork from your toddler child. You guys make me glad things have finally reached the stage in my family where we truly do no shopping and gift exchanging anymore. So much easier. We focus on the 3 kids but even keep that to a minimum, and when we all do get together, it's for a leisurely meal and good conversation. If you ask me, that's how it ought to be. Our family is doing the same. Each of us is a gift to one another. And we've learned the following: Spend something on someone to show them what they're worth, spen your time with them. Of another gift incident, well, two. 1) I was in a cousin's wedding and the other bridesmaids (one her sister, and also my cousin) insisted on having a fancy schmancy shower AND an engagement party. I have rules about weddings, one is I give one gift on one occasion - so if you got one at the shower, you're done but I also avoid showers like the plague, so it'll probably come for your wedding. And, two, I do not give engagement party gifts. So, this shower had already cost me $250, I paid $75 for the bachelorette party I was not attending because of another wedding, plus $50 for the bridesmaid gift and then I cut them off (because the shower ended up costing $1400 and I said we could do it for my $250 if we used someone's house and cooked ourselves - and it turns out my scones would have been far superior to what we did eat) and I still had shoes, hair, makeup, hotel room, etc etc etc to pay for for this wedding. And I said I wasn't bringing a gift to the engagement party and they (the other two bridesmaids) looked at me like I was NUTS. Hello, Miss Manners says so and not that this counts, but said cousin was previously engaged (didn't get married) and had a shower and I bought a gift and so did everyone else and the cousin dutifully asked if we wanted it back at the cancellation of the wedding, to which everyone but her sisters replied, no, keep it, you might need it. Plus, at a lunch with the bride she told me that she didn't even want a shower. This was after her sister INSISTED she did and insisted she'd be embarrassed if it wasn't nice. I did not have a shower for my wedding. I hate them and think they're a stupid waste of money and I told people if they really wanted to spend $1000 to watch me open a bunch of gifts I would save the gifts I got in the mail and they could come over, give me $1000 and I would open them in front of them. 2)The sister of the bride is constantly having parties for her children, which I also dont' attend because a)the kids don't need more presents and I'd feel obliged to bring one and spend money I could save on it b)I hate kid birthday parties almost as much as showers and c) the one time I did go to something for one of her kids and I did bring a gift I never got a thank you. Same cousin (the sister, not the bride, we like the bride) did not attend my wedding, nor did she send a gift or a card. Still pisses me off - all of it. And that is why Thanksgiving is my favorite holiday - no gifts! Are always so difficult to pin down appropriateness. Thank you so much for addressing this tough and touchy topic! We moved a few hours away from our homtown several years ago for many reasons, and one among them was the constant gift giving madness. I am not kidding. Every two weeks or so, we had to go to a gift-giving dinner at my parent's or my mother-in-law's house, and you were amost excommunicated if you missed one event. We finally were able to convince most of the family that lumping a few birthdays or other gift-giving occasions into a single event would really be easier on the budget and time constraints. Call me scrooge, but with ten grandkids under the age of eight, Christmas was a nightmare of loud, plastic useless toys, with millions of tiny pieces and packaging. Generally, the car would be stuffed to the gills on the way home, and I would select the three best gifts for each of our children from the ransom as they slept, and bring them into the house for after- Christmas Day play. The rest would either be packed (while they were asleep or already being entertained with their new toys the next day) in boxes and stored until a boring day in Febrary when I needed to make a zillion phone calls, or immediately packed into the Goodwill bag. SOMEone's kid would appreciate it, I reasoned. Very rarely, they would ask about something we had stored, and we'd "find" it for them. When we moved, we sent a list of requested educational magazine subscriptions, and have since tended to only visit during nongift holidays (New Year's or St. Patrick's for instance), since it is impossible for most of our relatives to stop shopping, no matter what their financial situation is. It is sad to say that their gift-giving tendencies helped drive us away, but we constantly told them it was only their PRESENCE, not their presents that we wished for, and we had a teeny house with almost no storage space. We really could not afford these events, either. Some people just don't get it. We left after the Christmas that my sister-in-law insisted we all pitch in for a leaf blower for my Father-in-law. Not only did the gift go against our principles (how about a nice rake instead and we all come and help?) but she made us feel that if we refused, we were utterly cheap and not team players. Ugh. These days, we also either give magazine subscriptions (after clearing it with the recipient) or give locally produced food baskets, wine or chocolate. Always appreciated, simple and surprisingly affordable and classy. The first couple of years after I was married I found Christmas was a very expensive business. My in-laws liked to give each other expensive gifts. This was fine because my husband's siblings were not married then and only had to buy a few gifts but we had gifts for my family also and had to buy 22 gifts. I suggested that we draw a name so that each person would get one good gift or limit the gifts to $10 or $20. They refused and one brother-in-law made a point of leaving the price tag on his gift to us. I certainly didn't stand corrected. He was just counting his one Christmas present to us. But we have given to him all year round, eg entertaining his friends when they were visiting our town - bil just gave our name and phone number without consulting us and telling them to look us up. Letting his friends stay at our place when we were on holidays. Treating him for meals and giving him books and other things. He would let us buy software and then he would borrow it and had the nerve to remind us to get the update! He took all these things for granted but it cost us time and money. My MIL rejected gifts we gave her. She just said she didn't want it, take it back. I took no pleasure in gift giving but my husband said we had to give her a gift. I would buy her something from a department store and she would receive her gift and the receipt so she could exchange it. I discovered that it was his family that insisted on Christmas gifts. Their spouses all shared the same view as I did but got no where about changing things. My SIL's husband said she didn't speak to him for a day after he suggested no gifts. Finally, a few years ago we said that we would stop giving gifts. Only those under 21 and over 65 would get a gift. And we would donate money to a charity. It created a big fuss. I couldn't understand why. After all, their kids would still presents. We don't have kids so, in effect, they got a better deal because they wouldn't have any costs and their kids got something free. My MIL called us cheap. She said that even when they were poor everyone got a gift. This is the woman who always rejected our gifts! My SIL said, "Don't you want to feel validated by having a gift?" Validated? I have enough self-esteem I don't need a leather eye glass holder, probably the cheapest item from Ferragamo, to validate myself! Most of the gifts we received from them ended up at the Salvation Army. Items such as the Itty Bitty Book Light, Deep Fryer, mostly stuff from Costco. All unused. And I noticed that they didn't care for our gifts either. Christmas dinner is at MIL's and his brothers don't even bother to take the presents home. They have been left in MIL's basement for years. MIL has a room full of Christmas presents, some unopened. We cleared out her pantry and threw out lots of stuff from Christmas baskets - cookies, tea, candies all untouched and past their safe-use date. What a waste! I jokingly told my husband that we should go into the basement, rewrap a couple of her gifts and give them to her and she wouldn't even know the difference. Actually, last Christmas I found an old gift bag and tag we had used for her gift. I used it again for our gift to her and as I hadn't dated it, we didn't have to write another tag even. How is that for recycling? Usually, I write a couple of sentences for comments but I have gone on and on. It is a sore sujbect. Which is sad because there is no spirit of Christmas in that sort of gift giving. Appropriate gifts are marks of good graces, personal tastes, and attention to the recipient. It should be given with no-strings-attached, but increasingly it is also used as a business transaction to curry favors. In lean years, I tended to give more organic gifts from the garden and orchard: fruits, bouquets, flower arrangements. Nowadays I make personalized sets of things and hand-deliver them. While we all try our best within accordance to our means and ability, and I'm sure we would all like to be good standing members of our community and families, some people's financial situation are simply bound to make them indebted (whether they feel it or not) and others will let people down. Others simply don't have the capacity to not seem vulgar and to cheapen the symbolic gift-giving. It isn't about the price tag, it's classically about the presence and the emotional value of the gift. It isn't easy, buddy if it were, then we wouldn't notice gift-giving guilt. We worry because we're afraid we might insult another person we care about. I suppose I myself would rather receive NO gifts than crummy gifts---but why not aim for good gifts... or excellent gifts...or marvelously personalized gifts? I'll concede that it particularly matters to me. I have always been more artisan-inclined, travel a lot, and I try to see it through that the presents honor that recipient, but then again, there are many people who are better than me in other skills such as writing that perfect letter, or being more witty and gregarious at the table. If I stumble across the perfect gift for someone, but we don't normally exchange gifts, how can I give it to them without putting them in that all too familar guilt situation? Wasn't there a Tibetan tradition of giving only one kind of gift - a scarf - everybody gives a scarf and is given a scarf. Just that. A scarf. Scarves flying around all over the place and no gift wrapping or folderol beyond - please accept this humble scarf - and say here's one for you too. A party? No problem. Everybody knows what to give and everybody knows what they will get. A scarf. "The worst kind of gift guilt I get is when friends in debt give something to me. I do appreciate the gesture, but I feel bad about it..."
That paragraph is exactly how I feel everytime I receive gifts from them. Some people loves you so much and they're buying expansive gifts even though we don't even ask nothing! I feel really sad and I would get them all the money they paid for the gift so they can put that money back into their CC. But that would be silly. So I can't. They do give those gifts because they want to, even though they can't afford too. Why oh why can't people just get that your joy in receiving the gift is all that the giver wants, and leave it alone! (IMHO, gifts that come with strings are not gifts but bribes, so yes, avoid these at all costs. I'm not talking about that.) With regard to the people in debt giving an expensive gift, of course you care about your loved ones who are in debt, but that debt is none of your business. It's not like you knew they were in debt and called them and told them you needed money. Geez, people! Unless you are in control of their finances for some reason, stay out of their business! Not that it's any of your business, but unless it's cash, you don't know how they came by the gift they're giving you. In any case, it may be that they are making all their payments on time, and the ability to give a nice gift to you is one of the few bright spots for them, but you want to take that joy away because you don't think they have any business giving an extravagant gift. That's just mean. I have just received two of the most extravagant gifts I've ever been given, and it has given me the worst kind of unsettling gift guilt. I really LOVE my gifts -- a designer hand bag and a designer watch. They were graduation gifts, because I just graduated from dental school, so in a way I feel that I deserve the gifts for my accomplishment. Also they are professional looking so that they are perfect for me to start my new life as an income-earning professional rather than a starving student. But, my practical and self-depricating side thinks they are too expensive for me! One gift came from my husband, and he gave it to me in front of my mother-in-law, and I felt a huge flush of guilt that I was receiving something so expensive from the person that has been supporting me for years, and I thought what does his Mom think of me accepting something so expensive from her son. My face turned red. And I actually said out loud that I felt guilty. Aggh. Which I know wasn't gracious, so then I felt even more guilty. Aggh. But for the rest of the evening I was beaming over the watch, so I hope that made up for it! I'll have to give my husband an amazing gift in the future. Do kids count as gifts? This is super annoying. Just accept the gifts you are given as a gesture of kindness from another person to you. You do not have to feel guilty or reciprocate. This incessant whining about how you "don't deserve it" ruins the pleasure of giving gifts and is primarily the point of giving (you don't deserve it, but someone wanted to do something for you anyway). Way to be a jerk about it. We're not guilty to insult the gift giver and if you are insulted by your gift causing guilt, you're not a good person, period. The way I've combatted this "gift guilt" is by asking people to make a donation to a charity if they absolutely insist on giving me a gift. or when your husband buys you a bottle of perfume you saw in the store and wanted and then on the way home says "I hope I have money for the bills now" yeah, nice!!! I ended up getting a 90$ gift from a male friend ( who was obviously trying to buy my favor) and I don't know how to fix it. If I keep the gift and tell him that I don't want his affection, I'll probably get called a gold digger. But if I ask him to return it ( they were online gifts for a game so I have to tell him to return them) I'll still probably get talked at unhappily. Anyone have any ideas? I'm like this a lot. Right now, I'm feeling really bad about a gift my husband gave me that I didn't like. He bought me a new purse because my old one was falling apart and I absolutely hate it. It's really ugly and I can't get my money or cards out of it. Now I'm stuck with something I don't want and I really don't want to hurt his feelings by returning it to the store and getting something else. The worst part is, he knows I hate it despite me saying that I like it.